Numerous guides on senior care typically focus on placing a loved one in a retirement home. There are times, however, children or loved ones find themselves in a situation where they have to move both parents to a senior living residence where they will receive the best of care in their golden years. It is a common scenario nowadays seeing that the US Census Bureau reports that the number of people who are 60 years and above and married is increasing while widowhood numbers are decreasing significantly. Assisted living for couples has to be amongst the most practical solution for seniors who are planning and thinking about their post-retirement years. It is the ideal option for life-partners who desire a maintenance-free lifestyle that comes with occasional assistance with activities of daily living when they are in need. Naturally, senior citizens who are still together in old age seek care programs that are couple-based to spend as much time together as possible together. Thankfully, there are assisted living homes that accept couples to live together as caregivers take care of their individual needs. 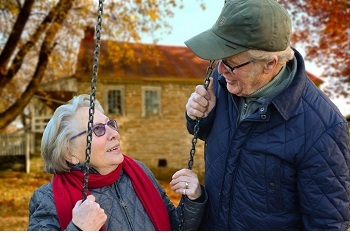 Assisted living facilities for couples are excellent for older adults who may require help with a broader range of activities in the future because they also provide amenities, hospitality services, as well as basic care services. These could include fun and beneficial community activities and events, medication management and memory care depending on the facility where the elderly couples decide to spend their post-retirement years. Couples have the freedom to choose the size of their living quarters depending on their budget, needs and what they like. Most assisted residences offer studios for people who do not want too much space as well as one or two-bedroom apartments. Some assisted living communities even have luxurious suites for the residents who prefer this type of living quarters. Senior apartments in the communities usually come with amenities similar to those present in upscale condos: fully loaded kitchens, garden and lake views, walk-in closets, private bathrooms, floor-plan choices, handheld showers, and most are wheelchair accessible as well. Before any couples settle into their new assisted living home, they go through a needs assessment. It is done by professionals at the facility to determine the individual needs as well as the needs they have in common. Follow-up assessment is also done after thirty days or as needed to check if there are any changes in regards to what the couple requires. Caregivers use the results of this assessment as a guideline on how to take good care of the residents. Examples of categories experts use for couples need assessment include personal care checklist, diet, housekeeping, mobility, transportation, and mental and behavior status. Generally, a person in an assisted living community will pay for the level of care they need. For instance, if the wife can take care of herself and is independent, she will only pay for room and board because she does not require any extra care. If the husband, on the other hand, has mobility problems or needs helps with medication management, he will pay extra for the care that he will receive. It makes things a lot easier because one member of the couple can receive the highest level of care while the other one gets less, where each receives the care they require. Price for board and care near you will vary depending on the senior residence that you pick. Some charge as little as $1500 monthly but the cost increases when the couple adds assisted living services they need. Some senior assisted living facilities utilize a tiered pricing model that features bundled services. It means that a resident who needs minimal assistance would be at the lowest tier. Other pricing models that the senior living communities use include a la carte, all-inclusive, and fee-for-service basis. Medicaid - it is ideal for aging individuals who do not have a large retirement or the ones who survive on smaller fixed income. Couples, however, have to first qualify so that Medicaid can pay for assisted living. Note that Medicaid can only pay for assisted services, never for board and care, and only in limited circumstances. You will need to check your state’s requirements as each state is different. VA - VA benefits are available to help pay for assisted living for vets or their spouses who qualify. Keep in mind that qualification is typically income based as well as based on the price of ongoing medical care which they deduct from a candidate’s annual income. Vets and their spouses are advised to check for VA benefits to find out if they can get some financial relief from the U.S. Department of Veterans Affairs. Better quality of life. Among the primary perks of husband and wife staying together in a retirement community is that they get to enjoy a better quality of life. The couple also gets to share a bond when they retire in the same place. They get a chance to continue their relationship in a lovely environment with less stress and the care they require. Access to Community and Events. Life for a couple can become quite boring when they stay alone in their house. Living with other senior couples and older adults in one location makes it easier to make friends and have a fun and fulfilling social life. Activity directors who work in assisted living communities also make sure that couples do not have dull moments by organizing activities and events they love to be part of. These include overnight and day trips, exercise clubs, games, happy hour, bingo and other entertainment options. Access to Care. Professionals at assisted living centers are always available to help senior citizens when they are in need. They respond faster to emergencies, which is something that can help save a life. Older adults can also access other things that improve their health including onsite services like doctor’s appointments, meal planning, nursing help and auxiliary services like physical and speech therapy. With the above information in mind, here is a helpful guideline that you can use in regards to placing couples in assisted living in a way that meets both their social and emotional needs. No one wants to be caught off-guard when it is time for their parents to transition into assisted living. It calls for thorough research of various residences before time to ensure that the aging individuals end up in a community that is a proper fit. Schedule at least 3 tours of facilities, and make sure to ask assisted living facilities proper questions during a tour to find out all the details you need to know. You must ensure that they allow couples to stay under one roof while they receive the care they both need. It is always a great idea to visit several places to get a first-hand experience of how they run things. It helps to make the decision-making process a lot easier. While looking for the ideal assisted living home, one of the most important things to think about is both the individual as well as shared needs of the future residents. Obviously, different couples will have varying relationship needs. If one parent is more mobile, sociable and healthier, it would help a great deal if the retirement community has appealing leisure activities that will fulfill the needs of both partners. Ask yourself whether it will be okay for one partner to leave the other and do something else that perhaps he/she is not in a position to complete. While doing your homework on the topic, ensure you have conversations with management or staff of the facility about the care and amenities they provide. It is the only way to be sure that everyone enjoys a satisfying quality of life in their new assisted living community. Also, remember to listen carefully to what the couple wants and needs before making any placement decisions. Having a financial plan in place is crucial for any couple that wants to explore assisted living together. It can be financially draining especially to people who do not have family or friends to contribute money for long-term care. Note that some residences may not be cheap especially for older adults that need memory care or have differing health status. Additionally, most do not accept Medicaid (in comparison, Medicaid will usually pay for skilled nursing care at nursing homes). Retirees and their loved ones should plan for long-term care properly if couples want to continue residing together safely and comfortably outside their home. Staying in an assisted living retirement community may not be the same as staying at home. It is, therefore, vital to make sure that both members of the couple know what awaits ahead. Keep in mind that although there are many seniors who are aging together, couples still remain the minority in the assisted living setting. It means that the living quarters are often designed for a single occupant. This aside, community life could be a new concept to the retired adults. Despite the fact that the couple will have a private living space, they may have to share other facilities such as lounges and play areas with other aged individuals. Regulations of daily life, coming in and going out of staff members, and the public nature of the senior communities is something that aging individuals need to prepare for so that they do not get too much of culture shock. When parents know what to expect in their new residence, it can help the transition to be a lot easier. Downsizing is common for parents moving to assisted living thus everyone involved should also prepare for this. Most residences allow occupants to decorate as they wish. Ask your parents to decorate as they see fit so that they can live in a homely place that they love and are happy with its design and décor. This will also ensure that they take the treasured personal items from their old home. Intimacy can be quite a touchy subject for retirees even though it is a normal act. Sexually active older couples need to understand the intimacy policies of the place where they will be spending a large part of their golden years. In most cases, couples can continue their intimacy practices normally in their private rooms. However, there are cases where if one member of the couple needs different assistance like memory care, they may be in rooms that do not have locks. In such an instance, management needs to make the necessary arrangements for intimacy to go on without any unwarranted interruptions. Discuss this with management staff before the move to ensure that the future residents are fine with the policies in place. There is likelihood that one or even both elderly parents might experience unforeseen health challenges in the future. It is therefore vital to find out how the facility you want to pick handles such a situation. In most cases, all one has to do is pay for additional services. When the health problems persist, inhabitants may have to move to an increased needs facility like a nursing home, which may or may not be part of the existing community. These are things that you should keep in mind so that everyone prepares for such eventualities. It is not every day that children get to arrange for assisted living for couples. It is okay if you not to have all the answers and solutions. When feeling stuck, talk to experts like financial planners, senior living advisors and any other professionals you feel would be of help to make sure that your elderly parents end up getting nothing but the very best. Couples staying together in an assisted living facility offers an excellent way of making sure that they are safe, happy, healthy, and receive the care they need without having to separate from each other. Finding the appropriate care comes down to prioritizing needs and wants of the couple. From here, both individuals and their family members have to find a workable compromise that works in the best interest of everyone to identify an assisted living facility that matches their criteria best.